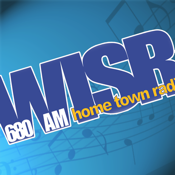 WISR-680-AM is Butler PA's Hometown Station. Broadcasting live from the City of Butler and offering local news, high school sports, locally produced talk shows and a great mix of Classic Hits. Our weekday schedule begins with the Morning News with Dave Malarkey, and Coffee With Kate, where you get Kate's unique look at local happenings plus the latest in Hollywood gossip and entertainment. When Dave and Kate get together, they rarely agree...but always entertain! Let's Talk features discussion and advice from local experts on a wide range of topics...from cars and finances to real estate and health care. After the news at noon, you can join in the conversation with our own locally produced call-in talk show, It's Your Turn. WISR's sports programming includes the Pittsburgh Penguins, and Knoch High School football and basketball. And on Sunday mornings we offer a variety of spiritual programs from local churches.